We have no idea why this short dead end tunnel is bricked up. The brick doesn't seem substantial enough to create a secure powder magazine. Another mine mystery! 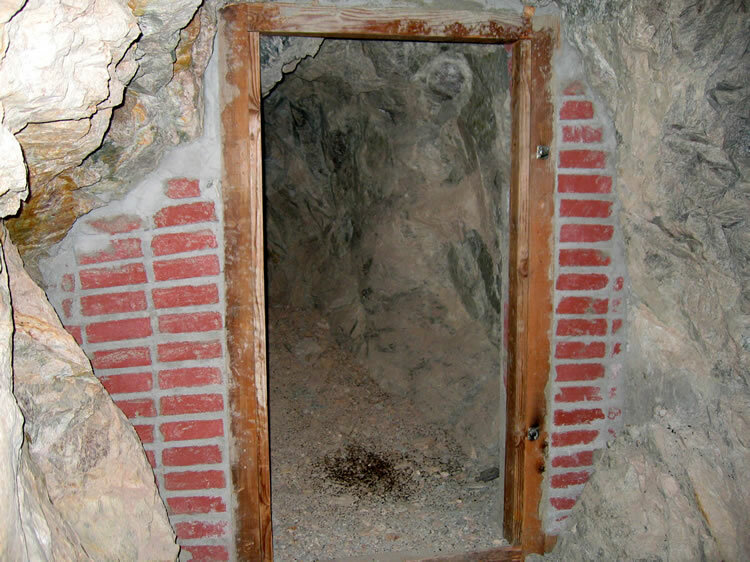 Well, this mine mystery just got solved on 11/10/07 thanks to an email from Jerry in Yucca Valley. Jerry's father-in-law worked the Black Metal Mine in the 1930's and again in the 1960's and 1970's, so when Jerry saw this photo he contacted us. He explained that the photo is of the dynamite storage area and relates the story of how in 1980 the steel door that was used to seal off that area was cut and the twelve remaining cases of dynamite were removed.